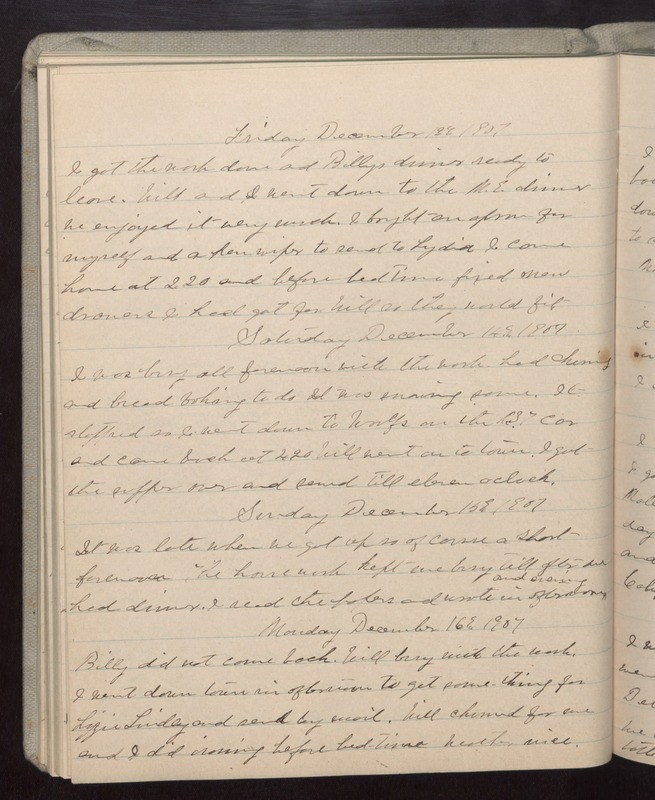 Friday December 13 1907 I got the work done and Billys dinner ready to leave. Will and I went down to the M.E. dinner we enjoyed it very much. I bought an apron for myself and a pen wiper to send to Lydia. I came home at 2.20 and before bedtime fixed new [drovers?] I had got for Will so they would fit. Saturday December 14 1907 I was busy all forenoon with the work had churning and bread baking to do It was snowing some. It stopped so I went down to Woolfs on the 1.37 car and came back at 4.20 Will went on to town. I got the supper over and sewed till eleven oclock. Sunday December 15 1907 It was late when we got up so of course a short forenoon. The house work kept me busy till after we had dinner. I read the papers and wrote in afternoon and evening. Monday December 16 1907 Billy did not come back. Will busy with the work. I went down town in afternoon to get some-thing for Lizzie Lindley and send by mail. Will churned for me and I did ironing before bed-time weather nice.